After boarding a bus, a tube, a train and then another bus, I finally reached my destination: St Augustine’s Church Hall in Slade Green. I had come to attend 'Young people making changes', my first Big Local learning and networking event. The event was facilitated by two Big Local reps, Wendy Sugarman and Kim Donahue, and was an opportunity for areas to share how they're involving young people and to highlight good practice as well as some of the barriers to involving young people. Slade Green’s youth forum manage their own fund (£5000) which they spend on activities and events. The youth forum are working help establish social enterprises in the area, specifically youth led enterprises, drawing on the support from UnLtd that is available to Big Local areas. Plaistow South Big Local’s youth market (pictured above and below) is run in partnership with a range of local youth agencies, and they would also like to develop the market as a social enterprise in its own right. Read more about the market. Bountagu’s youth forum has over 20 members and their chair is also on the Big Local partnership. They also run a weekly youth club for 5 to 11 year olds which is now so successful- with 110 members- that they’re moving to a bigger venue! The case studies and presentations were inspiring and impressive, and the young people spoke honestly and passionately about what they had achieved in their areas and what they planned to do next. I was genuinely surprised by the range of initiatives the youth forums were involved in, including arranging intergenerational trips and activities, setting up gardening projects, running weekly youth clubs, establishing enterprise clubs to support entrepreneurship, running youth market stalls, arranging courses to build skills and confidence… I couldn’t keep up! So, after the presentations, workshop and discussions, what stuck with me the most on the journey home? 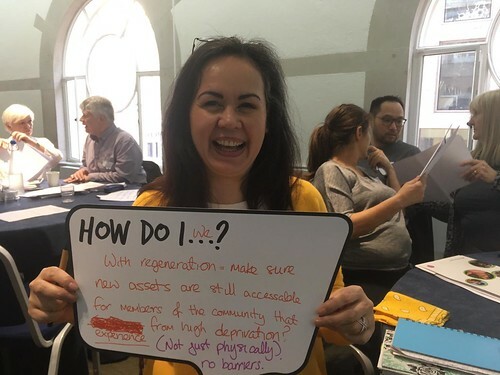 Young people care about their communities and have great ideas on how to make them even better places to live- engaging young people is key to making the changes in Big Local areas sustainable. Young people are more likely than others to get involved through their family members and friends, so it’s good to keep this in mind when trying to reach them and thinking about networks. To involve young people, focus on what they are really interested in. If you don’t know what this is, ask them- arranging activities based on what you think young people want, doesn’t work! Give young people a voice, role, responsibilities and autonomy- this can build their confidence, skills and experience, as well as keep them engaged. Be aware of some of the barriers to involving young people, including a lack of young people on Big Local partnerships, and any 'adult' structures that are in place, such has formal meetings. Consider how these can be more inclusive and dynamic! For more information about the event, contact Wendy Sugarman wendy@wsacommunity.co.uk. Check out tweets from the day by searching #futurelocal16 on Twitter.